This course will cover the topics normally covered in a high school geometry course. This course is normally taken by students in grade nine or ten. Students should have completed Algebra 1 before enrolling in Geometry. A detailed course outline is shown below. 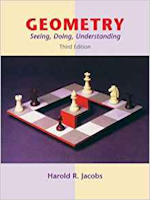 Geometry: Seeing, Doing, Understanding by Harold R. Jacobs, 3rd Edition, published by W. H. Freeman, 2003. 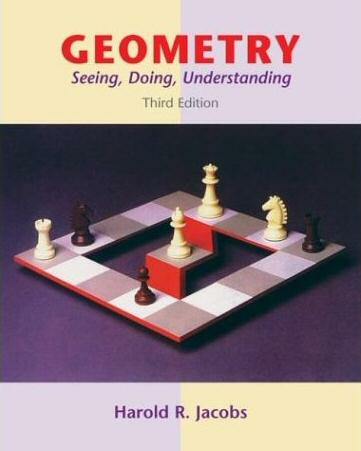 This is an extremely readable and engaging math textbook. The text emphasizes Euclidean geometry and explains the importance of logical reasoning and proof in mathematics. 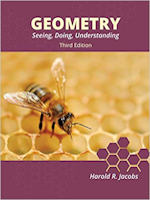 It has numerous practical and interesting examples and shows the many applications of geometry in the real world. It also touches on some important topics in analytic geometry (geometry in the coordinate plane), a topic that is essential for much further study in mathematics. We use the third edition of this text. There are three different printings of the third edition, all shown below. Any of these will do. Copies are also usually available to borrow upon request. Students will be given specific assignments to do on their own each week. Assignments will consist of additional lectures delivered on the computer, problems to practice, and homework assignments that will be collected and graded. To allow for the maximum amount of instructional time in class, tests will be given at home. One final exam for each semester will be taken in class at the end of the semester. Students will receive a numerical grade for each semester and for the year. The grade is calculated based on tests, graded homework and the final exams. The question is often raised, "When should a student take Geometry?" Geometry is somewhat different from the other high school math courses. The main sequence of algebra courses is typically, in order: Prealgebra -> Algebra 1 -> Algebra 2 -> Precalculus. Geometry, while certainly related, is somewhat unique, and can be considered separately from the sequence of algebraic math courses. Most schools place Geoemtry between Algebra 1 and Algebra 2 simply because it is generally a bit harder than Algebra 1 but not as difficult as Algebra 2. This particular course is designed to be taken after Algebra 1. 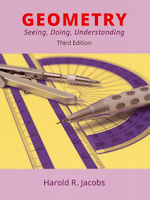 The course assumes that the students know basic algebra, and it also incorporates an Algebra Review lesson in most chapters so students don't lose touch with their Algebra skills during a year in Geometry. Although most students take one math class at a time, some students have taken this course concurrently with Algebra 2. Not all students require the same pace and difficulty level. Some may need or prefer a class that is more challenging and at a faster pace, while some may desire a class that is not accelerated. This class is offered simultaneously on two difficulty levels, regular and honors. The lectures are the same for both. The honors students will have additional homework problems that are more difficult, and on each test will have an extra page with more challenging questions. Note that the honors class is not an AP class. It is simply a more challenging version of the same course. The goal is for the classes to closely correspond to �Regular Geometry" and �Honors Geometry" classes at a good private school. Students may decide whether they will take the regular or honors version of the course after completing one or two chapters. Access to a computer with a high speed internet connection is strongly recommended, and is required for distance learning. Instructional materials such as lecture videos, lecture notes, homework assignments and tests will be available over the internet. Graded assignments and tests may also be returned via email in order to provide more timely feedback. Progress reports will be put on the website and updated regularly. These topics comprise the material normally taught in a high school Geometry course.